Former Maryland governor Martin O’Malley (left) and Boston City Councilor Matt O’Malley. Martin O’Malley, the former Maryland governor and 2016 Democratic presidential candidate, will come to Boston to fund-raise for ... City Councilor Matt O’Malley. 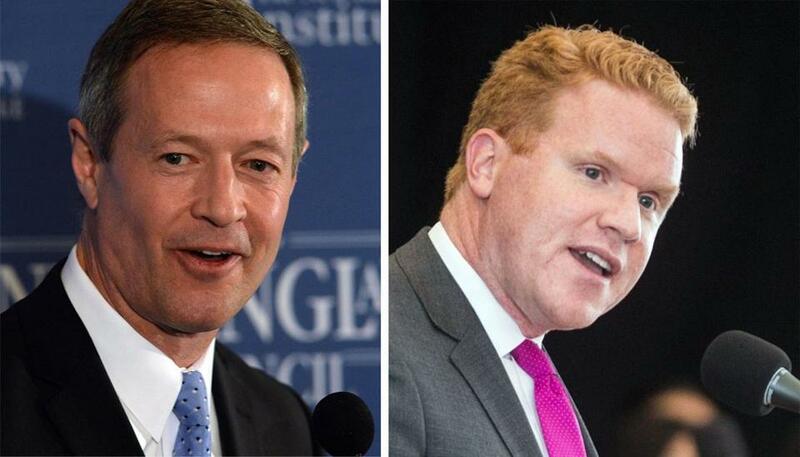 The two are not related, although O’Malley — the councilor — appears to have embraced the confusion. Councilor O’Malley served as a surrogate for the former presidential candidate O’Malley at the Massachusetts Democratic Convention in August 2015. During a presidential primary debate, O’Malley, the councilor, fielded tweets intended for O’Malley, the candidate. “#WrongOMalley, right candidate. Join me in supporting @MartinOMalley,” he tweeted. O’Malley, the councilor, once hosted a Jamaica Plain fund-raiser for O’Malley, the former presidential candidate, who dropped out of the race after receiving less than 1 percent of the vote in the Iowa caucuses. Now O’Malley, the former presidential candidate, is returning the favor for the councilor from District 6, which includes West Roxbury, Jamaica Plain, and parts of Mission Hill and Roslindale. Councilor O’Malley recently announced a “winter fundraising reception” later this month with a “special guest,” former governor O’Malley.